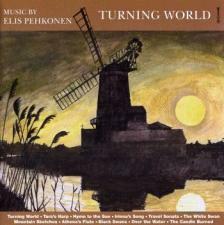 Merlin Classics is proud to present Elis Pehkonen's new CD "Turning World" which marks his 40 years as a professional composer. Based on the theme of travel and performed by established UK artists, this CD is one of the most interesting composer-compendium CDs to emerge in recent years. It takes the listener on a journey around the world, from the shores of England with "Turning World" to Spain to enjoy the beauty of the "Basque Love Song" and on to Australia to witness the dramatic flight of the "Black Swans" in a setting of verses from A B "Banjo" Paterson's poem of the same name.